Long time I haven’t posted anything. Sorry for my silence and hopefully I will be regular from now. In this recipe I use fresh grated coconut. Instead of fresh grated coconut you can use 2 tablespoons desiccated coconut soaked in 1 tablespoon coconut milk/milk. 1. Soak lentil about ½ hour in water and drain water thoroughly. 2. 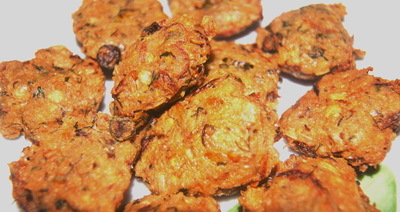 Make paste of lentil, coconut and prawn and mix rest of things with it. 3. Heat the pan with oil. When oil is ready add make flat fritter and put on oil carefully (you can use spoon and don’t squeeze the mix). Don’t overcrowd the pan. 4. Fry them till these become golden brown. Repeat the process to finish the mix. 5. 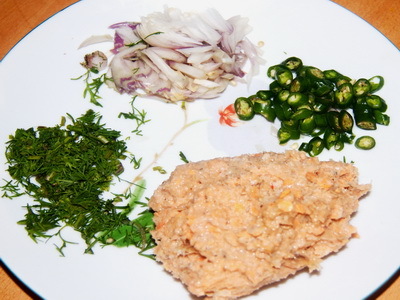 Serve Chingri Bora/ prawn fritter with rice or as a snack.